With our desert botanical appetite whetted, Eric and I raced to our next destination: Tucson Botanical Garden. (Actually, we spent a little time with the friends we came to visit first.) TBG isn’t as large as Phoenix’s Desert Botanical Garden, and far smaller than Boyce Thompson Arboretum. Tucson Botanical Garden began as Rutger and Bernice Porter’s family home (built in the 1920s) and their business, Desert Gardens Nursery. When Rutger Porter died in 1964, Bernice donated the property to the City of Tucson, but she continued to live in the house. Bernice passed away in 1983, and the city deeded the property to Tucson Botanical Garden. This brilliantly back-lit cactus greeted us as we entered the garden. Pity that I didn’t record the name, but it reminded me of my mom’s old crown of thorns … on steroids. It’s not from around here … maybe Madagascar? I noticed these women just leaving after a plein air painting session. Perhaps if I lived in Tucson, I’d join them. I noticed large trees that I would not have expected in a desert garden. This was April, and they were just beginning to leaf out. A large deciduous tree shades a patio near the Porter house. A crape myrtle (Lagerstroemia)? In Arizona? These trees have a tropical origin. The Porters’ original house is now used as an admin and gallery space for the TBG. I circled the building, surprised at the undesert-like leafiness of the plantings. A patio tucked into a corner. The back door and sunny garden with roses. Colorful botanical appliques decorate a wall bordering the parking lot. Look at these shutters made out of sticks! The front door with its shady patio. Straw yellow stucco with sage green trim and surprisingly bright red downspouts. The shocking periwinkle blue of the adjacent herb garden pergola was the perfect color to make the plants stand out. What a striking color scheme for the desert! Even on a hot day, these blues look cool. We walked on through a series of themed desert gardens. The day was hot, in the upper 90s, and shade was hard to come by. The trail winds through the cacti and succulent garden. Funny little Piaranthus geminatus Asclepiadaceae from South Africa. Piaranthus produce beautiful, fleshy star-shaped flowers. I don’t know what these are, but their little pink blooms are so cute. A crassula lit by the sun. It’s a shrimp plant (Justicia brandegeana), of course. Another small house … on the map it’s labeled Friends House. Something about this door and the rustic landscape drew me in. More red and green accenting on an adobe house. Colors that I wouldn’t otherwise put together seem to work here. On the other side of Friends House, we found yet another structure … this one larger and definitely open. We ate a delicious and memorable lunch at Café Botanica. I highly recommend it for their fresh and local cuisine. Looking into Café Botanica. We ate on the patio. Market umbrellas usually mean food is near. I was famished. Outside the restaurant, these cacti glowed in the late afternoon sun. After a late lunch, our tour was nearly over. We ended it in the Plants of the Tohono O’odom Native American garden. A fence made from ocotillo branches! Handy stuff. Creosote bush (Larrea tridentata chaparralis), or greasewood, is common in the desert Southwest. This stunning gate marked the end of our tour. Does this garden seem lush and cool? And of course, the house would have to be an oldie. Something that Georgia O’Keeffe might like. After we left the garden, we drove downtown on Broadway. Suddenly we were passing a treasure trove of Tucson’s vintage homes—the kind that get my DIY juices flowing. My head was on a swivel! Granted, at this time of our lives, the last thing Eric and I need is another century-old fixer-upper, but I still enjoy imagining what I’d do with these oft-forgotten little gems. In the Rincon Heights neighborhood just south of the University of Arizona, we found plenty of these charming southwest bungalows. It’s a very modest neighborhood, and I don’t know how safe it is, but if people restore these homes, the neighborhood will improve. I saw some evidence that this is happening. Here’s a slide show of a baker’s dozen houses that I love, captured from Google Maps. (Sometimes I don’t feel comfortable pointing a camera at people’s homes.) Notice the interesting ziggurat shapes of their buttress walls, and the repetition of arches. Many have beautiful (and apparently original) red tile roofs and metal-framed windows. Whew … these houses need us. But so does our own house here in the Northwest. I’ll leave you with a sampling of photos from the Arizona Sonora Desert Museum. Then, we’ll head back to the Northwest. See you next time, Arizona! I finally got a good, close shot of an ocotillo blossom. A century plant (agave) bloom stalk. Silken blooms on a hedgehog cactus. A saguaro next to a century plant (agave) in full bloom. This entry was posted in Garden, Travel and tagged Spanish eclectic residential architecture, Tucson Botanical Garden, vintage Tucson homes on October 21, 2018 by D'Arcy H.
Happy autumn, everyone! What a summer we’ve had. A couple of hurricanes tried to drown Hawaii (I sheepishly admit, when I first heard about Hurricane Lane, I thought they were talking about something akin to Tornado Alley). The west coast burned while Wisconsin flooded. Florida’s waters turned toxic. Hurricane Florence slammed the Carolinas. Whew. Let’s rewind, shall we, to a gentler season—last April, when Eric and I spent a week in Arizona. Here in the Pacific Northwest, we’ve had such an abrupt switch of seasons that I’m glad to think about sun again. After a few days in Phoenix, Eric and I set off for our ultimate destination of Tucson. Still excited about what we’d just seen at the Desert Botanical Garden in Phoenix, we couldn’t resist a quick stop at Bryce Thompson Arboretum State Park, near Superior, AZ (“the largest and oldest botanical garden in Arizona”). Quick only because we’d arrived an hour before closing time, and we didn’t have time to explore the entire trail system, which is extensive. Boyce Thompson Arboretum trail map. We hiked from the parking lot to the lake and back, along the purple trail. You might be thinking, “You’ve already seen every single plant the desert has to offer. Why go to yet another botanical garden?” True, each garden features many of the same plants, but each garden is different in scope, design, terrain, and just the feel of the place. Boyce Thompson was a very different experience than the Phoenix Desert Botanical Garden. For one thing, we were nearly the only people there so late in the afternoon, which was wonderful. At 323 acres, Boyce Thompson Arboretum was large enough to make me feel like we were actually setting out into the open desert. While these plant vignettes were certainly deliberately planted, they looked so natural, it was easy to think they just “happened” that way. Agaves and golden barrel cactus. Unsure what these are; possibly a thicket of young senita (Pachycereus schottii). We passed the Smith Building (1925), constructed of native rhyolite, mined just across the highway. Originally the visitors center, it’s now the interpretive center. Attached greenhouses hold collections of succulents from around the world. Unfortunately, it wasn’t open late in the day. Smith Building, 1925. The original visitors center. Occasional ramadas such as this one provide shade for hikers. Ramada on a hill. Yucca rostrata on the left, agaves and barrel cactus in foreground. Saguaro cacti frame a classic view of the West. Pipelines deliver water from Queen Creek and a cistern high above. We walked the trail to Ayer Lake, which stores water from Queen Creek. Cute little lizards ran all over. This one looks like an Elegant Earless Lizard. Cute little guy (or gal?). Loved this sign for “Boojum Cove.” And sure enough, boojum trees appeared! You can’t beat a boojum tree (Fouquieria columnaris) for weirdness. Beautiful blue agaves … probably a variant of A. americana. The prominent tubercles tell me this is a tree cholla (Cylindropuntia imbricata). Wouldn’t want to meet this guy in a dark alley. This totem pole cactus (Pachycereus schottii forma monstrosus) is really in a twist! Don’t they have a great texture? A little bunny let us get right up next to her to take photos. We came upon a grove (not sure that cacti come in groves, but …) of golden barrel cactus. I would have loved to grab one of those pups to take home, but TSA would not appreciate finding it in my suitcase. Golden barrels are endangered in the wild, but later I found one of my very own at Lowe’s (go figure). Golden barrel cactus (Echinocactus grusonii), also known as Mother-in-law’s cushion. That’s so mean! Isn’t this Agave pelona a beauty? Nothing lives forever, including this saguaro. It’s a beautiful piece of sculpture, though. We returned to the parking lot where they were having a plant sale. Why, oh why didn’t I buy some of these Astrophytum myriostigma? Only $5.00! Look how cool they are! Guess what–I’m still not done with the Arizona desert! I have one more post in this series, in which I come to a realization about desert gardening and residential design. I hope you don’t have to wait for it as long as you did for this one. The days are getting cooler and shorter, so I’m spending more time indoors … which may help my blog production. And of course, I have more stories about our recent house projects, so stick around! This entry was posted in Garden, Travel and tagged Arizona botanical gardens, Boyce Thompson Arboretum, Desert plants on October 4, 2018 by D'Arcy H.
Our little greenhouse is a last-century addition. It was built in the late 1990s when my ex-husband got hold of a bunch of 1940s-era fir casement windows that a friend was surplussing. He set about building a greenhouse, appending it to the rear of the Model-T-sized garage. It’s about 12 feet wide and 6 feet deep. Some 20 years later, the greenhouse was needing serious TLC. Here’s how the greenhouse looked a year ago, just before our new back fence was installed. But wait! I had this post half-written when I collected some photos from Eric. He supplied me with several from 2008, and reminded me that he did the first major rebuild back then! My spotty memory skipped right past that era. He claims that he should have taken the whole thing down then and rebuilt it from scratch. If you ask me, he nearly did. 2008: The greenhouse seems to be a magnet for junk we don’t know what to do with … including the kitchen sink (far right under the gray planter)! For the new south wall, Eric created a knee wall of concrete block (which serves as one wall of our raised veggie plot), rebuilt the window wall framing, and reinstalled the windows. He also installed new rafters and new fiberglass roofing. And that was how the greenhouse survived for the next 10 years. Summer of 2017: Siding has been removed. Here you can see the concrete block foundation. Eric started the 2017 renovation by installing a new, mo-bettah roof and new siding. We looked at UV-resistant polycarbonate panels at the Home Show and Garden Show (the kind greenhouse kits are made of) and knew that was the way to go. Eric ripped off the sun-brittled fiberglass wiggle-board roof (again), replaced the rafters (again), and installed half-inch twin-wall 8 mm polycarb panels. Already the greenhouse looked more substantial, and it was so much warmer. We successfully over-wintered all of our succulents and a friend’s young fig tree. September, 2017: Eric installs the polycarb roofing. New siding is temporarily tacked onto the south side. After the new roof was installed. Siding has been removed for painting. Lots more light … and UV resistant! This spring, while I was busy relandscaping half of the backyard, Eric continued on the greenhouse. The vintage window frames originally had been varnished, but never painted. By now, the varnish was long gone and the window glazing was dried up and falling out. Eric reglazed the windows, replaced all the window framing (again! ), installed trim, and painted the whole thing to match the house. What an improvement! That left the west side—the end with the door—or in this case, a frame where a door should go. For the life of this greenhouse, a succession of roll-up bamboo blinds have served as the door. They blew around in storms, their ropes hopelessly tangled, and eventually, each blind rotted in the soggy Northwest winters. Unfortunately, the door frame wasn’t quite tall enough to accept a standard door. It’s never simple, is it? West wall with windows removed. The greenhouse is still full of junk. It doesn’t look any better in a closeup. As you can see, Eric had his hands full removing the rotten wood and reframing the walls. One of the old window panes broke, so instead of glass, he replaced the lower two windows with spare polycarbonate material. I like the look. I would have liked polycarb in all the side windows, but we didn’t have enough. Our gargoyle guards the door. He (she?) needs a name. The door opening, which was just a couple of inches too short to accept a standard storm door, could not be raised. So, Eric cleverly built out the frame and installed the door against the exterior wall instead of inside the door opening. Hey, this is just a greenhouse … what code? This should really be Eric’s blog, huh? An easy fix–apply the door to the outside of the building! Only when the exterior was done did we tackled the mess within. I was always frustrated by the collection of odds and ends that somehow migrated into this small space. I literally could not step more than three feet inside the door, and even that was challenging. Too bad if I wanted something in the back (besides, I didn’t really know what was in the back). And the tangle of garden tools? Impossible! ARRGGHH!!! We pulled the entire mess out onto the lawn and sorted it: dump, garage, or greenhouse. For once, only select gardening-related objects were allowed to be stored in the greenhouse. The south wall and bench. 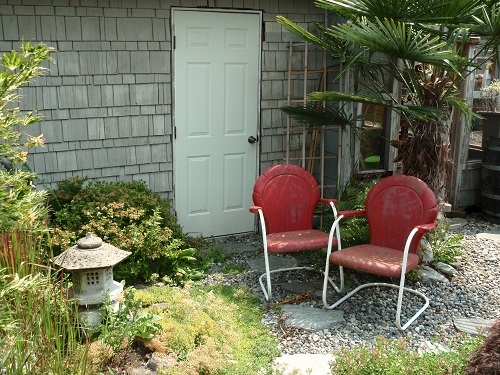 Finally, Eric built a step in the gravel in front of the door, and paved the area with flagstones. Sweet! That green table inside? It was in the basement when I bought the house. It’s the base of a Hoosier-type kitchen cabinet. In rough shape, but perfect for a greenhouse. Complete with human door and cat door. However … it’s been a very hot and dry summer here in the Northwest. Endless sunny days really up the temperature in the greenhouse, and I couldn’t last in there for very long under the direct sun. So, I bought some canvas and made a couple of grommeted shades, which we hung from hooks. Frank Lloyd Wright taught us that trick. The shades don’t lower the temperature much, but standing in shade is preferable to standing in sun. We’ll remove them in the winter, of course. I added some solar-powered landscape lights to the window shelf. They make a nice glow in the evening. I love puttering in my greenhouse now. I’m out there every day, sometimes just to enjoy looking at tools that I can actually reach! That’s a wrap on another project! This entry was posted in Exterior, Garden and tagged greenhouse, polycarbonate panels on August 8, 2018 by D'Arcy H.
We visited three botanical gardens in Arizona … too much for one post, so I’ll break it up into quicker reads. Grab a cuppa joe and settle in … because this will be a spiny post, heavy on prickly photos and short on words. Lots of eye candy for fans of desert flora! One of our must-see destinations was the Desert Botanical Garden in Phoenix, a 140-acre site with five distinctive loop trails. We had time for only three, which means we must return. (We’d return, regardless.) I’ll name the plants that I know, but I don’t know them all. Here we go! Yucca rostrata, nature and Chihuly’s versions. Blooming blue palo verde (Parkinsonia florida), the Arizona state tree. I like how the colors are echoed in the potted agaves. As we walked inside, we were surprised by this enormous lavender head, the first of several large, colorful ceramic sculptures by Jun Kaneko that were displayed throughout the garden. Featured art installations change several times a year. Untitled head by Jun Kaneko. Probably my favorite desert plant, Santa Rita prickly pear (Opuntia santa rita), because — purple and green! See the squirrel among the blind prickly pear (Opuntia rufida)? There are many varieties of opuntia. We walked the Wildflower Loop first. More Jun Kaneko heads in the background. They made great landmarks. The butterfly pavilion was a special treat. Photographing flitting butterflies is difficult! Fruit of the fishhook barrel cactus (Ferocactus wislizeni) look like little pineapples. Brilliant orange claret cup cactus (Echinocereus triglochidiatus) blooms. I don’t know what the yellow flower is. Another Santa Rita prickly pear. I love cactus flowers. We continued on the Desert Discovery Loop. We were reminded that all cactus are succulents (they store water in their leaves), but not all succulents are cactus! Only cactus have spines that grow from areoles, whereas succulents may have spines, but they do not grow from areoles. Got that? Take a look at some of these examples. There are many varieties of agave, which are succulents with spines, but no areoles. This young cardon (Pachcereus pringlei) is a cactus, with spines and buds growing from areoles. A boojum tree (Fouquieria columnaris) — yes, they DO exist! It’s not a cactus. Black spined prickly pear (Opuntia macrocentra), definitely a cactus! Ouch! A saguaro, but not a cactus–because it’s a sculpture made out of wrenches. Unfortunately, I didn’t record the artist’s name. We detoured into the shorter Center for Desert Living Loop to visit the herb garden. There, I found the beautiful Archer House, built in 1952 and named for Lou Ella Archer, a founding member. I cupped my hands around my face and peered into the windows, trying to look past my reflection. I was shocked to find a face peering back at me–a man working at his desk! Archer House, 1952. Love the color — maybe because it’s the same color as our house! A tourist studies the Archer House. This might be Agave potatorum, contrasting beautifully with rosemary. We came upon a grove of giant cardón (Pachycereus pringlei), the largest columnar cactus in the Sonoran Desert—far larger than saguaro. Some of these rose over 60 feet in the air. We could tell they were very old. Magnificent cardons grow up to 60 feet. Past the cardons was another Jun Kaneko sculpture. Just ahead was another adobe-style building—Webster Auditorium, originally built in 1939 as the garden’s administration building, and named for founder Gertrude Divine Webster. Our time was running out, so we completed the Desert Discovery Loop and returned to the Admissions and gift shop courtyard … but not before passing a few more beautiful specimens. Yucca rostrata … looks very Dale Chihuly. I like how this head’s colors complement the landscape, and the stripes echo the ribs of the golden barrel cactus (Echinocactus grusonii). Look at these silver torches (Cleistocactus strausii) with their topknots and red schnozzes! Such personality! A gorgeous group of blooming claret cups (Echinocereus triglochidiatus). I want a desert rose (Adenium). I’ll leave you with this one, who took out all his false teeth for this photo. I’m unsure what species it is, but it’s Something cristata, or crested. I didn’t know at the time what a comparative rarity this condition is. It’s caused by a cellular mutation, usually due to injury or disease, that makes the cells multiply in a linear fashion. I’m going to look for cristata succulents in nurseries now. I gotta have one! An unidentified columnar crested cactus. In part 3b, we’ll head east a few miles to tour the Boyce Thompson Arboretum before we finally get to Tucson. Stay cool! This entry was posted in Travel and tagged Desert Botanical Garden, Jun Kaneko, Phoenix Arizona tourism on July 15, 2018 by D'Arcy H.
I met identical twins Lucy and Ethel last summer at my neighbor’s yard sale. We hit it off immediately and they came to live with us that very afternoon. After spending the winter holed up in the garage, the ladies shyly emerged and have sat for some weeks now in the shade of the Chinese windmill palm. You see, Lucy and Ethel don’t feel quite up to going out in public. Being of a certain age, they want to have a little work done first. Lucy and Ethel in their shabby dresses. Normally, I would assure them that the patina of their years is a beautiful thing, and advise them to wear it with pride … but in this case, I find myself agreeing that improvement is warranted, and even necessary. There’s just too much weather damage and discoloration. Too many years without sunscreen, and I want them to be around for a long time. Lucy (or is it Ethel?) even has a couple of crude tattoos: “Jean” and “Jim.” Jean was my mom’s name, and it doesn’t belong scrawled across the poor chair’s face. Can you make them out? At some point, the girls tried a cheap cosmetic solution of bright red paint. Whoever applied it did a lousy job, and their makeup smeared and ran. If this isn’t proof that a bad makeup job can age you, I don’t know what is. My plan is to give Lucy and Ethel a place of honor on the new side porch, so it’s time to take action. Their previous owner (who moved away) gave me a business card of a friend who does walnut blasting … which of course I’ve mislaid. But having their paint professionally removed wouldn’t be very DIY, would it? Why not go the more difficult, messy, and time-consuming route of grinding it off myself? After all, I have nothing better to do. Don’t worry, girls … I have a plan. The thing is—and I haven’t shared this with L&E—I have no experience refinishing metal, and I don’t really know where to start. It seems reasonable to grind the paint off with a wire brush, so at Lowe’s we bought a wire complexion brush for my friends. Looks mean, doesn’t it? I don’t think I need to take them completely down to bare metal, but I do need to smooth them out before giving them a fresh coat of glossy Rustoleum. That’s the plan. Hold still, Ethel (or are you Lucy ?) … this will sting a little. After a good ten minutes of exfoliating on her arm, this was the result. It’s down to bare metal, all right. The paint did come off with some pressure, but the drill was unwieldy and Ethel danced around in pain the whole time. I can’t see how I could keep this up long enough to get all the paint off both chairs, including their backsides and underarms. Maybe it was the 90-degree heat on the back deck that made me feel like quitting. That’s right, I wrote that post three years ago, almost to the day! Someone must have leaked the paint stripper idea to Lucy and Ethel, because they beat feet back into the garage, not to be seen for three years. It seemed obvious that the sand blasting or walnut blasting idea just wasn’t going to happen, so I scaled back my expectations and decided that elbow grease, sandpaper, and spray paint would be better than nothing. L&E agreed, as they weren’t getting any younger. I wanted the pair to be front and center for a party we were about to host. Some WD40 helped loosen bolts that probably hadn’t budged for decades, and soon the ladies lay in pieces. I figured I’d use my Mouse sander on most of the flatter areas (although nothing on these gals is truly flat) but I also bought a shaped foam hand sander to get into smaller areas. Turned out, I didn’t use the Mouse at all because the hand sander did the trick. Sanding created lots of red paint dust. I was glad it didn’t blow around, because I detest wearing a dust mask (bad, I know). 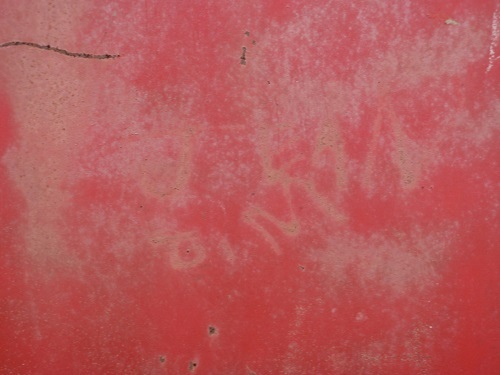 Tomato-red paint and rust dust. After sanding each piece, I wiped it down with a damp cloth, let it dry, and carried it to my paint booth (a plastic tarp on the grass, with concrete blocks to lift the pieces off the surface). Every single time I set pieces on the blocks to be painted, the breeze came up. Every. Single. Time. I sprayed anyway. Spraying is not the most economical way to apply paint. 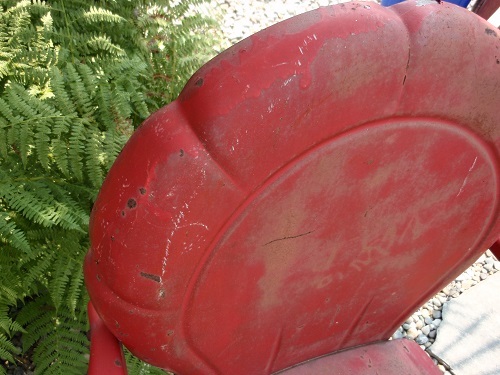 The arm and leg tubes are Krylon Fusion Gloss White, and the armrests, seats, and backs are Krylon Fusion Gloss Red Pepper. Paint booth — a tarp on the grass. Each piece required at least three coats. After painting, I’d wait about 30 minutes, then spray another coat. According to the instructions on the can, you can recoat up to one hour later, but after that you have to wait for 48 hours, otherwise the coat won’t adhere or can develop orange peel. Lucy and Ethel couldn’t risk that. The actual painting was so much fun—watching the faded, beat-up chairs come to life with color and shine. Except when the skies began spitting. Oh, NOOOOOO!! I tried to sand out the fisheyes, but I was only moderately successful. Wet paint + raindrops = fisheyes. This seat was the worst of the pieces. Assembly day! We attached L&E’s bodices to their skirts with new stainless steel bolts (a gift from Eric). Their bolts will never rust again. We slipped their white arms into the red sleeves, then bolted their arms and legs into their bodies. Body ready to attach to arms. Eric tightens the new bolts. And there they were, resplendent! Don’t their petal-topped outfits remind you of 1950s kitchen aprons? Lucy and Ethel hopped right into position on the deck, ready to party. I’m so proud of them! They’re not perfect, but I assured them that if you were born in the 1950s, no one expects you to be perfect 65 years later. As I went back in the house, I heard Lucy giggling—something about all the backsides they were about to meet. Or maybe it was Ethel. Epilogue … and almost tragedy. After Eric and I put the chairs together, he suggested adding a clear coat to protect the finish, which hadn’t crossed my mind. I was glad we didn’t have to take the girls apart again. I simply sprayed them intact, using Krylon Crystal Clear Gloss. 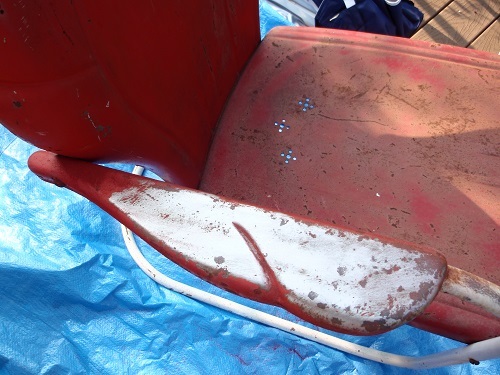 But wait—WTF?—the gloss coat didn’t appear glossy, especially on the seat and back. In fact, it dried decidedly UNglossy and changed the texture of the metal from fairly smooth to sandpapery! I have no idea why the gloss coat reacted adversely with the red paint. You’d think paints of the same brand would be compatible. I wonder if the can was spraying propellant instead of paint? Has anyone else had this experience? I was so mad that I didn’t even think about taking photos. I slipped some white garbage bags over the chair arms to protect them, then recoated the seats and backs with gloss red. It helped a lot, but I don’t think the seats are quite as glossy and smooth as they were before the clear coat. But, disaster averted—whew! Lucy and Ethel exude confidence now and look amazingly bright and cheery on the deck. They’re my new favorite garden accessories! Lucy and Ethel are ready to party! 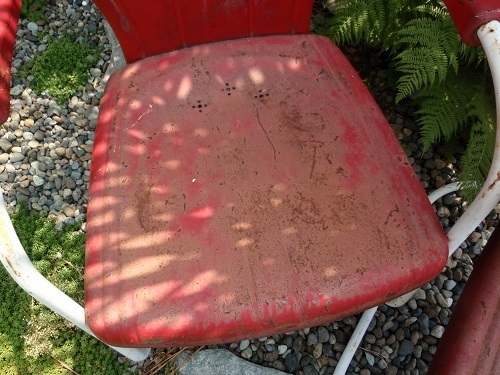 This entry was posted in Exterior and tagged 1950s garden chairs, Craftsman bungalow DIY, refinishing metal chairs, vintage metal garden chairs on July 5, 2018 by D'Arcy H.
We’ve had plenty of time to sew up our backyard makeover, and indeed, it is almost a wrap. Eric and I have been working diligently on this project since we returned from our Arizona vacation in mid-April. The final touches may well be in place by the time I finish writing this post (because it takes me forever to crank out a blog post). For weeks, our backyard looked like a plant sale at a construction site. This view made me feel a little overwhelmed, but we’ve worked our way through all of it. These two hombres supervise. Chex looks tough, doesn’t he? I busted my hump creating the rain garden, but I got to know my chiropractor better. The garden is dug, rocked, planted, mulched, decorated, and lit. Duke has dug it up at least five times, despite our (obviously too-wimpy) protective wire fencing. I have uttered many four-letter words as I replanted the poor, abused plants. Gotta admire Duke’s determination, though. I especially enjoy the new view from our bedroom window. So do the cats … one is often on the windowsill. Ginger keeps an eye on our progress from the bedroom. Here are some in-progress photos. During construction: Laying out the bigger rocks. I sort of bowled them into place to achieve a random scatter. Large and smaller river rock is in. We use the narrow, fenced side yard (through the gate in the photos above) to store large items like aluminum ladders and wheelbarrows … but how to get there across that creekbed? Eric built a beautiful, gently arched Japanese-style bridge that will make it easy—and safe—to haul awkward items and wheelbarrow loads across the creek. The area under the gate’s swing is paved with flagstones. A gently arched bridge spans the dry creek bed. Most things in the woodland garden in the back corner of the yard are thriving, although Diggety Duke had his way with a few unfortunate plants there, as well. The sword ferns are going bonkers. Eric and I picked out the gorgeous lantern in the corner for our ninth anniversary present. The back corner is ferny. While I rocked and planted (and replanted), Eric was busy doing his own heavy work. He restacked the veggie garden wall and filled the garden with new soil. (We’d used some of the old soil to build up the woodland garden after the fence was built.) Veggies are sprouting! We’re growing radishes, onions, garlic, carrots, spinach, parsnips, turnips, and rutabagas. (Does anyone else call them “rootabeggers” from childhood?) In the containers are bush beans and peas, Swiss chard, sweet peppers, and pickling cukes. On our deck are cherry tomatoes, Interlaaken grapes, a fig tree with 16 little figgies, and a lovely lemon tree (with teeny-weeny fruit!). Over on the deck, I couldn’t resist buying this set of lime-green chairs to compliment agave Maria in her red pot. I resurrected a Midcentury hairpin table base out of the garage and painted it and a new table top to complete the set. I like the bright colors. Green chairs and red pot. He also relaid and raised the brick apron leading from the alley under the gate, and created flat areas for our garbage, recycling, and yard waste receptacles. Eric lessened the slope of the brick apron from the alley into our yard. On the alley side, it’s all business. In total, we’ve moved over 5000 pounds of soil, rock, mulch, and pavers—most of it multiple times. We are tired. But we are happy. To finish off our design, we installed some landscape lighting. Small solar lights shine down from the tops of the fence posts, and solar lanterns punctuate the garden. I added a few spotlights to highlight trees, and Eric installed a solar light in the tall lantern. It’s a little fairyland at night! We’re pleased with the results of all our work, but as any gardener knows, the work is never done. I’ll close with a couple of Eric’s shots. Blue glass Japanese fishing floats in our rain garden. This entry was posted in Garden on June 27, 2018 by D'Arcy H.
After our visit to Taliesin West, Eric and I headed to the Paradise Valley area of Scottsdale. I was excited to show Eric a place that had enchanted me years earlier. Cosanti, an Arizona Historic Site, is the home and studio of architect Paolo Soleri (1919 – 2013), who was once a student at Taliesin West. Soleri is best known for his experimental urban laboratory, Arcosanti, 60 miles north of Phoenix. Soleri coined the name Cosanti from two Italian words: cosa and anti, meaning “before things” or “against things,” depending on which source you consult. Soleri and his wife, Colly, bought five acres in Paradise Valley in in the 1950s, long before suburbia hemmed them in. The property is now surround by fashionable homes. In 1970, Soleri began building Arcosanti as a prototype self-sustaining city with a densely settled, small footprint. Artisans at both Cosanti and Arcosanti produce and sell bronze and ceramic wind bells of Soleri’s design to fund their existence. Stepping out of the car in an unassuming gravel parking lot, we walked under lacy olive trees to the entrance of the Cosanti compound. Suddenly, it’s as if we were on another planet or on a sci-fi stage set. The setting is a feast for the eyes, and a lot to take in. As at Taliesin West, concrete is the construction material of choice (cheap! ), but the effect is entirely different. Soleri experimented with using concrete to construct apses—quarter spheres—most decorated with strange and fanciful designs. The apses are positioned to take advantage of sun in the cooler winters, and shade in the blazing summers. Some of the structures are partly underground for additional insulation. These shelters are made by heaping up a big mound of earth, then pouring concrete into frames laid on top. When the concrete cures, dig out the earth, and you have an apse. Admission is free, but we chose to pay for a guided tour that had just started. Just ahead, down an allee overhung with olive trees and sculptures, was an apse filled with our tour group and bronze wind bells. I wished for a breeze, but the hot air was still. I wished I could have all the bells. Entrance to a strange land. We entered the apse. I didn’t know where to look: up at the decorated ceiling or at the forest of wind bells that surrounded us. It felt like a small cathedral … a little weird, a little awe-inspiring, and entirely engrossing. A large bronze pendant dominates the ceiling. Wind bells hang from the ceiling like flowering vines. The only cat I saw on our entire trip. Our tour guide explains it all. Larry, our tour guide, had worked at Cosanti for 20 years, so he had worked with Soleri directly. He explained Cosanti’s history and architecture, and Soleri’s vision for the wind bells. Larry referred to himself as an artisan: a person who creates art using someone else’s design. We moved to the next apse, this one full of ceramic wind bells. And a gorgeous red roof. This was the bell assembly area. Red roof and pink bougainvillea. A chain of wind catchers. Larry led us on to another large apse—the bronze foundry, which would have been off-limits to us had we not been on the tour. The apse looks like it’s made from wood because wood was used to create the form for the concrete. Just as at Taliesin West, white canvas panels provide protection from the sun and a pleasant, even light. Artisans set up sand bell molds for a pour. Molds are made from a special sand that can withstand high temperatures without melting. The sand is surrounded by a thick metal jacket for stabilization. There’s a funnel-shaped hole at the top of each mold into which the bronze is poured. The day was sweltering hot, but the men who poured the molten bronze had to wear heavy buckskin coats, chaps, gauntlet gloves, and face shields for safety. They deftly moved the crucible of 2200°F, glowing yellow bronze from mold to mold, pouring smoothly. I could tell they’d done this many times. Moving the crucible of molten bronze from mold to mold. Sand molds without metal jackets are on the right. Watching the men pour the silky looking liquid bronze was fascinating in a scary sort of way. The bells are beautiful when they emerge from the mold, but they darken to a gray color as they age. Soleri preferred to use an acid bath to add a verdigris color. Because the color varies, no two bells are the same. A newly cast bell (left) and a finished one after an acid bath. It was beastly hot in the foundry apse, as you can imagine. I backed out under the olive trees, hoping for a breath of air. Behind us hung a large bronze sculpture belonging to the Goldwater family, returned for restoration. You can see its natural gray color … and an iconic Cosanti window behind it. Our tour group bakes in the foundry apse. A large bell assemblage awaits restoration. A dinosaur’s ribcage? Soleri’s office is behind the portholes at right. On the other side of the tunnel was an apse where ceramic bells are fired. Behind that was a curious half-underground building that served as living quarters for the apprentices onsite. See those steps that go down into the pit? They’re simply timbers that stick out of the wall. I took a break sitting on the hefty timber railing of the bridge. We exited the earth house through the door at the top of those timber stairs. In front of us loomed the enormous concrete roof over the swimming pool. This mammoth slab is supported on 12 utility poles. Like everything else at Cosanti, it’s been there since the late 1960s. This stuff holds up. Wonder how much it weighs. The wall of a small apse near the pool featured this poem. A poem on the apse wall. We had reached the end of the developed property, and the tour was over. Thanks, Larry! We returned to the gallery, where we’d started. The sidewalk near the foundry apse. “Exit through the gift shop,” we always joke. A display at the gallery. We knew we wouldn’t escape without choosing something special to bring home. Because I had been to Cosanti and Arcosanti before, I already had some goodies, so I wanted Eric to pick this one. He chose one of Cosanti’s Cause Bells, which donates part of its cost to a cause of our choosing (ours benefitted the Phoenix Desert Botanical Garden). This bell has a varicolored polished finish, a little different than the acid-washed bells. It’ll look good in the modern house we’ll have some day. A polished bronze Cause Bell. I’ve had my two Soleri bells, both from Arcosanti, for years. 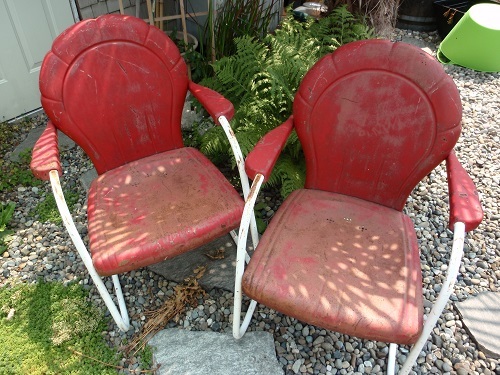 They’ve accumulated more patina as they’ve aged. These bells are LOUD. I used to have them hanging on the front porch until a summer storm blew through. The next morning there was a note from the city police that they caused a disturbance, and I had to take them down. They’ve been in a box for years, but I’m going to put them back up in my backyard garden … without the wind-catchers. These ceramic tiles are from my first visit to Cosanti. Something about this desert place, with its mysterious symbology and dusty, sunbaked concrete structures from the 60s speaks to the hippie artist in me, and it feels like home. (I was never a true hippie, and can’t really call myself an artist, but I hope to become one when I grow up.) I hope you enjoyed the tour and get to explore Cosanti (and Arcosanti) for yourself someday! This entry was posted in Architecture, Art, Travel and tagged Cosanti, Paolo Soleri, Soleri wind bells on May 21, 2018 by D'Arcy H.
I’ve been eager to get to my big spring project—creating a new landscape for half of our backyard. Now that I’m retired, I have nothing better to do all day than “putter” in the garden … or work like a dawg, whichever way you want to look at it. If you don’t enjoy this kind of stuff, you call it yard work. But if you love it, you call it gardening. I love it, and I’m so happy that I get to do it every day, for as long as my 60-something bod can take it. Here’s the plan … not necessarily to scale, but close. It’s always wise to start with a plan–although most of this was in my head. And here’s where I started. What a mess! Last fall while the new cedar fence was being installed, we erected a temporary wire fence to keep Diggety Duke out of this half of the yard. We left it up all winter to keep him from creating more craters in the mud. The fence also effectively kept us out of that half of the yard, and nature took over. I love Nature, but … she doesn’t always consult me on gardening plans. I had to start somewhere! The cats liked sitting on this board pile. They were the only ones who appreciated it. I happily realized that I wouldn’t have to reseed the resulting bare patch because that portion will be paved with diamond turf pavers to provide an off-street parking spot (should we need one), a project that Eric began a few years ago. Ultimately, we will need to seed, but not right now. Pavers will create a secure parking spot. I began in the far corner. The two sword ferns, which I inherited from my parents’ property, needed their annual trimming. The one next to the gate had grown so much that it interfered with the gate’s swing. It would have to be divided. I trimmed both ferns; the other one (behind the birch tree) had been damaged during the fence project, but these prehistoric plants are tough—it’ll come back just fine. Off with the old fronds, exposing spring fiddleheads. This damaged fern looks sad but it will recover. In the midst of weeding. Then I weeded and leveled out the soil in the corner until it was below the bottom of the fence. Eric reset some basalt rocks to hold the upper tier of soil and created a short rock wall (to the right of the birch) to hold the new fern. I am lucky to have him to do the heavy lifting, otherwise I’d be in traction now. I tried to separate that big ol’ fern myself, but I hadn’t eaten enough Wheaties. It was incredibly stubborn, but Eric finally persevered. I planted it in its new home and surrounded it with a nice cozy blankie of leaf mulch. We only lost a few fiddleheads in the process. Now I’ll have three sword ferns! This old fern has many crowns. Now the gate can fully open. The separated fern crowns in their new home. I transplanted a hellebore, our prized black trillium, an autumn fern, a tiny purple painted fern, and a variegated hosta to fill in the area. Not done yet … room for more plants! Now this space has potential! I hate to admit our yard had gotten this bad. Seen from the bedroom window, the creekbed will follow the rope outline. I lined the trench with weedblock fabric, but I ran short of staples. It didn’t take long for the cats to mess with it. Almost ready to rock and roll! This project is coming right along … it’s so much fun to go out to the “jobsite” and get dirty every day! Now, BRING ON THE ROCKS!! 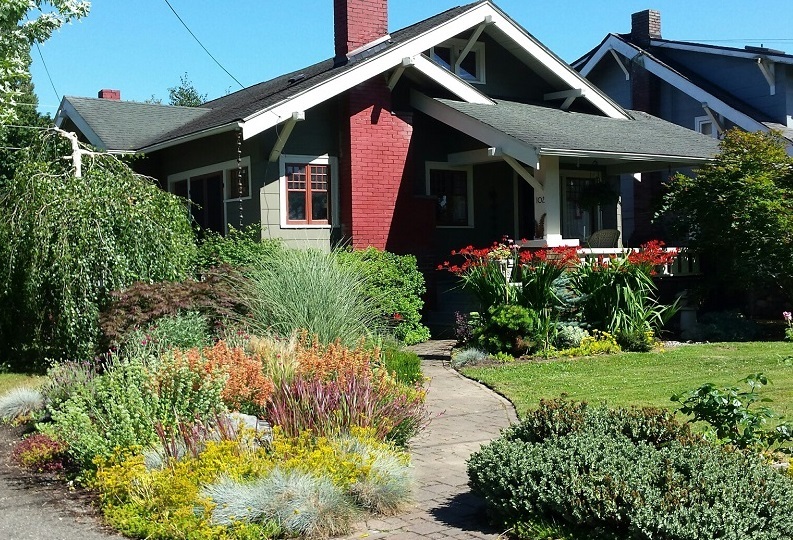 This entry was posted in Garden and tagged acer shirasawanum 'Sensu', dry creekbed, garden redesign, rain garden on May 8, 2018 by D'Arcy H.
What better way to kick off retirement than a vacation? Or, as Eric pointed out, a vacation for him, but just a trip for me. A couple of our friends recently have moved to a retirement community near Tucson, AZ. We could hear the desert calling—as well as the offer of a few nights’ free lodging. Eric and I love the Southwest, so this was an easy decision. We arrived in Phoenix and drove to Tucson via highways 60 and 79. When I first visited Taliesin in the 1980s, it seemed far from town, in the middle of the desert. It’s still in the middle of the desert on nearly a square mile of land, but town has caught up. Scottsdale’s residential communities, swimming pools, and golf courses press against its borders. But when you’re there, you’re in another world. The driveway wound uphill until Scottsdale faded from view … and we entered a world of rustic rock walls and signature red paint. Angles, stone walls and palo verde trees. Wright and his architectural apprentices began building Taliesin West in 1937. Using materials found on the site, they placed flat rock faces against plywood forms, then filled in with smaller rocks and concrete. (Can you imagine hauling these big rocks out of the desert with the sun beating down?) Our tour guide credited Wright for coining the terms “one-man rock,” “three-man rock,” etc. for measuring rock size, but I have not been able to corroborate that. The logo is thought to have been influenced by a petrograph on the site that resembles clasped hands. We entered here, going down the stairs to the gift shop to buy our tickets. Next, we walked outside, past the drafting studio and large, triangular pool. The wing to the left in the following photos is the drafting studio. Its roof is also canvas, which floods the space with so much light that electric lights are not needed during the day. The architecture and materials echo the shape and texture of the McDowell Mountains. A glimpse of the stairs to the pool. Looking back toward the drafting studio. The main building seen from the lawn. From the tip of the lawn’s triangle, we walked back to the main building and through a breezeway whose low ceiling created a welcome flow of air. Workers were busy restoring the roof. I took a shot of the dining room—looking serene and cool in royal blue—through the glass. Blue-upholstered dining room ready for lunch. We entered the living room, know as the Garden Room for its view into an enclosed garden. This room was air-conditioned, for which we were thankful. (You can bet it wasn’t air-conditioned back in Wright’s day. This is a comfort added for modern visitors.) The room featured the same white canvas roof panels and Wright’s famous origami chairs, which are made out of a single sheet of plywood, and are surprisingly comfy. Garden room showing canvas ceiling. One of my favorite details: The layout of Taliesin West makes an attractive screen. I’ve been to Taliesin West three times since the 1980s, and each time the tour is different because additional parts of the site have been restored and others are closed for restoration. This time, Mrs. Wright’s bedroom was featured. It’s a tiny room with a single bed, but two walls are covered in this colorful Japanese print. She called them swans … I call them cranes. We walked through a mysterious passage and were told to listen for a fountain. We could not hear the fountain until we came upon it. Don’t you want to know where this leads? We stepped out of the dark doorway into the fountain courtyard. Finally, we walked through another courtyard filled with Heloise Crista’s sculptures and stood outside these intriguing doors. We were about to enter the cabaret, where Wright entertained the celebrities and influential people of his day. Beyond the doors, we entered a long passageway with views down into the cabaret. Wright really knew how to create a dramatic entrance. Inside the six-sided room, the acoustics were nearly perfect. We sat in the back and could hear our tour guide whisper. Sitting in Wright’s cabaret. Entrance hallway on the left. Detail of cabaret wall sconce. Down a long walkway under wooden beams. Another look at the promenade. The red doors open into the drafting studio. The white squares are shutters for the windows. If we could have seen the drafting studio, it would have looked like this. Wonderful light! The traditional canvas roofs, which quickly rotted from sun exposure and had to be replaced occasionally, have been topped with protective Plexiglas for years. We learned that the Frank Lloyd Wright Foundation is now partnering with Sunbrella to replace the canvas with UV-resistant Sunbrella fabric. I’m sure this won’t be our last tour of Taliesin West. Maybe next time we’ll explore the desert shelters or take the dramatic nighttime tour. Can’t wait! I’ll post more desert adventures in between updates about the home front. Lots happening there! This entry was posted in Architecture and tagged Frank Lloyd Wright, Heloise Crista, School of Architecture at Taliesin, Taliesin West on April 26, 2018 by D'Arcy H.
Everyone eagerly waits for spring to come, but I’ve never been as impatient as I’ve been this year. Not for the spring that began on March 20, but the one that began on March 23. That’s the day I retired. I’ve been anticipating retirement for years, thinking about it daily, picking a date, sliding it to the right. Again. And again. When the large aerospace company I worked for decided to move some 3000 jobs to Arizona (including mine), the decision was made for me: It was time to stop sliding the date and just slide out the door. Leaving people I’ve worked with for years, as well as the Midcentury office complex and its beautiful landscaping (cherry trees bursting into bloom) was bittersweet … but I have my own gardens to tend, literally and metaphorically. What intrigues me now is this: Who will I become in retirement? The door is wide open. All I have to do is walk through. And, after working my entire adult life, I must give myself permission not to have a job! While I won’t predict who the retired me will become, I can tell you I’m stoked to tackle my list of projects and I have all day, every freakin’ day to work on them whenever I want! Or not! I’ll share them with you as they rise to the top. 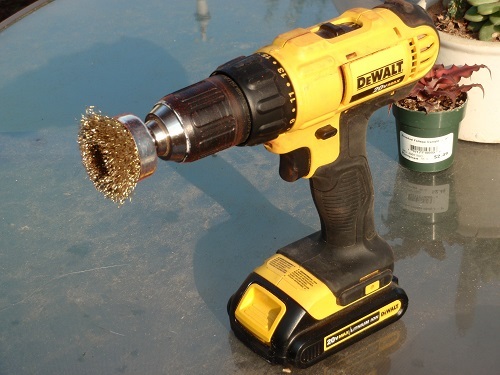 First up—outdoors: Finish pruning the Japanese maples, and weed, weed, weed! I felt pretty good about the way I tamed the backyard sumo wrestler, so I was eager to go after the smaller laceleaf in the front yard. I found it much easier to prune because it hadn’t had so many years to take off on me. Getting things trimmed up for spring. Duke peeks through the cat hole in the fence. Whenever I walk by the gate, I see this. Crosby keeps an eye on things from the side porch. Next, relandscape the backyard! The poor yard took a beating when our new back fence was built last fall. The rains came as soon as the project started, and although the fence looked great, everything else ran straight downhill. Duke has been confined to the north half of the yard ever since, which has suffered from him doing his business and from his excavation hobby. I’m hoping that closer parental supervision will ease his digging compulsion. But doesn’t this maple look great against the house? Step one of the backyard renewal is reseeding the lawn. After the fence was built, we kept the temporary Duke fence up to thwart his digging in torn-up gardens. I covered Duke’s worn-out lawn with cedar chips to keep down the mud. It worked well … or so I thought. I began to rake it up and bag it … and the ammonia stench overwhelmed me. Duke has a habit of stepping a few feet off the deck and relieving himself next to the laceleaf Japanese maple. After absorbing pee all winter, can you imagine the odor? It actually burned my throat! It ranked right up there with my other least-favorite smell: mildew. In fact, dog pee ammonia makes mildew smell kinda fresh. Raking the nasty bark chips. The most natural solution is to cover the ground with an inch or so of compost, which loosens and enriches the compacted soil. We picked up a few bags of compost at the store, along with a brand new Garden Weasel cultivator. (I love the way it jingle-jangle-jingles like a pair of spurs.) I got right to work running the Weasel over the hard soil. Fluffing it up only released more of the noxious smell. Then I aerated the patch by stabbing it with our pitchfork. Over and over and over again. The grass couldn’t be more dead. Forked and weaseled, ready for compost. Crosby inspects and signs off on my work. The next day, I started to cough. Despite taking allergy meds, I’m still bothered by seasonal allergies. I already had my usual spring sore throat. But the upper-respiratory cough grew rapidly worse, and I became paranoid. I looked up ammonia poisoning and found that breathing ammonia causes pulmonary edema. Eric pointed out that had I done such a job at work (unlikely as that seems for a technical writer), I would have had to wear a respirator. For two days I worried as the cough worsened. I hadn’t even been in a confined space—I was out in the backyard, in the clean urban air! Don’t worry, though … the cough was only the beginning of a monstrous cold. Nevertheless, if I ever clean up ammonia again, I’ll wear a respirator. A few days later I re-raked the area, liberally tossed on the grass seed, and waited for rain. Now we’re just waiting for the grass to sprout. And I’m still trying to kick the nasty cold. For some relief, my next post will take us far away from our dreary Pacific Northwest spring. This entry was posted in Garden and tagged composting the lawn, Craftsman bungalow DIY, spring gardening on April 6, 2018 by D'Arcy H.